Managing cytomegalovirus (CMV) retinitis (a viral infection that can lead to blindness) in patients with AIDS. It may also be used to treat resistant herpes simplex virus (HSV) of the skin or mucous membranes in patients with weakened immune systems who have failed to respond to standard treatment. It may also be used for other conditions as determined by your doctor. Foscavir is an antiviral agent. It works by inhibiting the growth and reproduction of viruses, which helps fight off infections caused by viruses. This medicine contains foscarnet which is one of a group of drugs that act against viruses, that is, an antiviral agent. What is Foscavir® used for? Foscavir is mainly used to treat the symptoms of cytomegalovirus (CMV) infection of the eyes, in patients with acquired immune deficiency syndrome (AIDS). Foscavir will not cure this eye infection, but it may help to control worsening of the symptoms. How does Foscavir® work ? Foscavir acts by interfering with the growth and reproduction of the virus. Foscarnet is an antiviral medication that prevents certain virus cells from multiplying in your body. 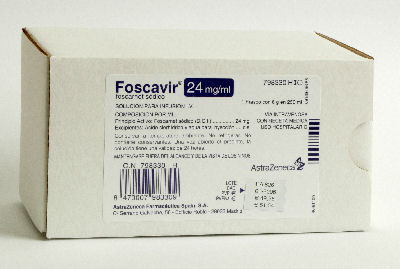 Foscarnet is used to treat cytomegalovirus (CMV) retinitis in people with AIDS. Foscarnet is not a cure for CMV, and the virus may progress during or after treatment. Foscarnet may also be used for purposes other than those listed in this medication guide. Foscavir is an antiviral medication used to treat an eye infection known as cytomegalovirus (CMV) retinitis in patients with the human immunodeficiency virus (HIV). While Foscavir will not cure a CMV infection, the medication inhibits replication of CMV and helps hinder the infection's progression.